You can here see 1 holiday homes, town houses, villas or holiday apartments in Andalusia - Costa del Sol. Lovely townhouse overlooking the Mediterranean Sea, the mountains and the white village of Torrox Pueblo. 2 bedrooms, 1 bathroom and nice roof terrace. Ca. 50 km. 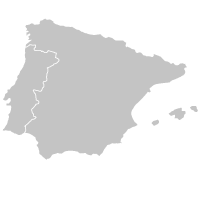 east of Málaga. 5 minutes drive to the water. 4 persons 2 bedrooms Dishwasher Washing machine Distance to the sea	: 4500 m.